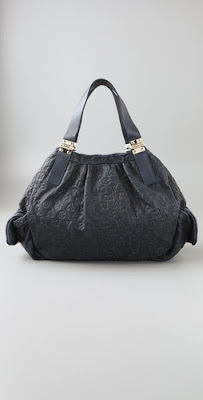 I love the shape of the Marc by Marc Jacobs bag. The size seems perfect for everyday and carrying all the things I need. Also, I love the shape, it's classic with a modern twist. The bag looks like it can be comfortably worn on the shoulder or on the arm. I also like that the leather is monogramed. Usually I'm not a fan of logos but I think it adds interest to the bag and because its black on black its not so noticeable. The inside is super fun too! 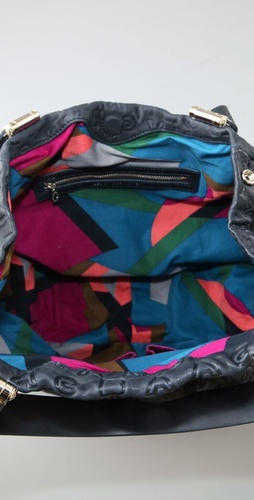 Take a look at the fun fabric that lines the inside of the bag. love the lining..so cute !!! To be honest, I don't think it looks very attractive. The inside is kind of fun though. Oh my, loving it:) So georgeous. I'm a sucker for grey bags... want it!